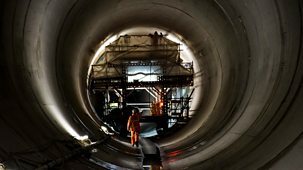 London's Victorian sewer network is at bursting point, and now a huge engineering project is underway to massively expand the capital's capacity to deal with its own waste. 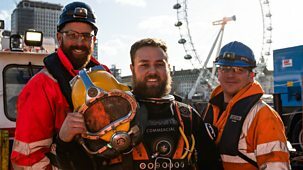 In this three-part series, cameras are at the heart of the action, following workers across the capital for three years as they race to build the enormous tunnel on time and on budget.\n\nIn this third and final episode of the series, tunnelling in central London finally begins. 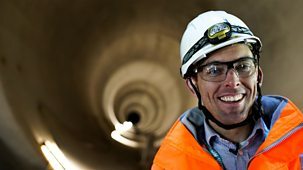 To complete the 16-mile main section of the super sewer, four bespoke tunnelling machines have been designed and work is underway to prepare for their launch. \n\nIn Battersea, one of the strategically most important sites on the project, the team must assemble the £15m tunnel boring machines on site. The 100-metre-long, 9-metre-diameter machines have been stripped down into component parts and sent from the manufacturer in France. Now the team has just three months to put together the 900-tonne jigsaws, before lowering them 60 metres into the ground, to begin tunnelling in earnest. \n\nAhead of the machines setting off, the opening section of the tunnel in Battersea has to be burrowed by excavators and reinforced with spray concrete lining to prevent it collapsing. The team are on a tight two-month schedule, but when their tunnellers hit the 52 million-year-old compressed rock of the Upper Shelley Beds, progress is in peril. \n\nOn the Thames, there's a much-needed boost for the tug and barge industry, as super sewer project managers commit to moving 90 per cent of waste material from the tunnels by river - and that means opportunities for ambitious crew who are looking to make a step up. \n\nBut the mammoth engineering effort of the super sewer team isn't good news for everyone on the Thames. Bright yellow amphibious Duck Tours vehicles that take tourists through the city centre are forced off the river, as engineers need to take over the river bank they use to launch.